Skyscrapers, hot dog carts, infrared commotion – I remember none of this from my childhood trip to New York City. But the Magic School Bus I got to sit in at six years old? Now that, I remember, because Ms. Frizzle and the book series she starred in were too cool for school! Now that I’m ‘up there in years,’ the Magic School Bus has honked its horn and rolled off my bookshelf. But, a recent hop onto the ferry of nostalgia had me reflecting upon the series, and I found a whole new reason to appreciate those old-school books: Ms. Frizzle’s stupendous style. 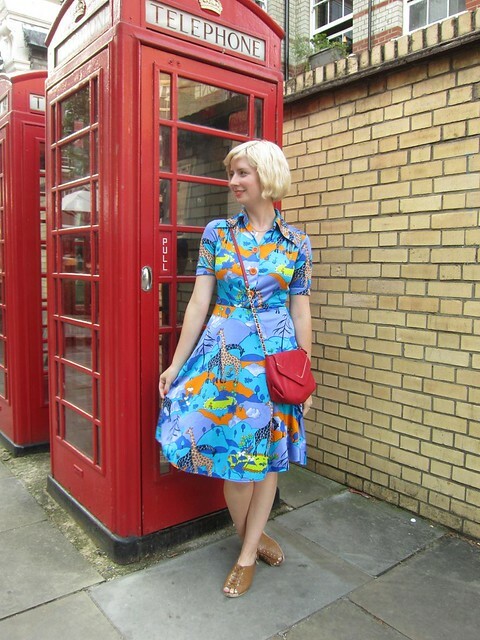 Do you find Ms. Frizzle’s wardrobe as electrically awesome as I do? Wow, way to take me back! I read all of The Magic School Bus books, and even watched the TV series. I always loved how her outfits matched whatever the lesson of the day was. Oddly enough, I do consider Ms. Frizzle as a style icon, she taught me to accept my big/red/curly mop. I love the way she dresses, and I love how much I learned from the books and the show. I will never forget that digestive system episode or the one with the lactic acid (same episode?). These books were so awesome! I loved Ms. Frizzle. I totally forgot about Ms. Frizzle! She has some amazing dresses! Wow, that one dress with the teeth is pretty perfect! I really, really want those telephone earrings! Susan is definitely channeling Miss Frizz! I LOVED The Magic School bus books and I loved Miss Frizzles crazy dresses! And this really goes a long way to explaining while I still seek out novelty prints like there’s no tomorrow! Miss Frizzle is my jam. She is the reason I majored in Science. i looooved those books when i read them with my son years ago–and the TV show was good too! there were just tantalizing little bits about ms. F’s back story/lovelife…madeira’s blog is wonderful!